One of the highlights of the holiday season is indulging in all the wonderful food. As a foodaholic, I wondered if there were more days, in addition to Thanksgiving, that were specifically devoted to the enjoyment of food. With the help of Holiday Insights, I learned from my internet research (believe what you will!) that there are many wonderful eating days in store for me in the next couple of weeks. So join me as I pull on my elastic-waist pants and savor the food-filled days of December! 12/1 – Eat a Red Apple Day – At least we can start the month off with healthy food. 12/2 – National Fritter Day – A fritter is a fried cake or dough with fruit or meat inside. You can use the apples you didn’t eat yesterday to make apple fritters today. 12/7 – National Cotton Candy Day – Cotton candy is a popular summertime treat, so why do we celebrate this day in December? 12/8 – National Brownie Day – A personal favorite, especially with a glass of milk and a second brownie. 12/9 – National Pastry Day – Oh, where do I begin? 12/11 – National Ring Noodle Day – Holiday Spaghetti-O’s just wouldn’t be the same without them. 12/13 – Ice Cream Day – Enjoy an ice cream cone, a sundae, or a milkshake today. Or, set the diet aside and have one of each! 12/15 – National Lemon Cupcake Day – My favorite? A lemon cupcake with chocolate icing … yum! 12/16 – National Chocolate Covered Anything Day – I’ll let you decide what is too extreme, and how much is too much, if any. 12/18 – Bake Cookies Day – How come Bake Cookies Day isn’t immediately followed by Eat Cookies Day? 12/19 – Oatmeal Muffin Day – I guess they had to toss in at least one other some-what healthy food. 12/22 – National Date Nut Bread Day – A second cousin to pumpkin bread, but it has its own redeeming qualities. 12/24 – National Egg Nog Day – Eggnog lovers are ecstatic that this day exists. It’s loaded with stuff that tastes really good; it’s also loaded with stuff that’s not good for you. 12/27 – National Fruitcake Day – A celebration of the rock hard, fruit-filled holiday cake. Its density has hampered our ability to use carbon dating to identify the age of a fruitcake. Unconfirmed rumors suggest that some fruitcakes are hundreds of years old. 12/30 – National Bicarbonate of Soda Day – After a month’s worth of indulging, nothing else could be more perfect. Pass the Alka Seltzer, please! 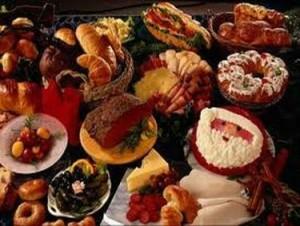 Whatever you choose to indulge in this holiday season, ENJOY!